For additional details and photos of MSI skid systems, please visit our Aviation Refueling Systems section. 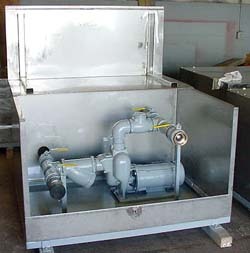 MSI's Diesel Unloading Cabinets feature a close-coupled, self-priming Centrifugal Pump to assure rapid and reliable unloading of tank trucks into aboveground or underground fuel storage tanks. "Double-T" inlet and discharge piping enable both truck loading and unloading by the system. An oversize strainer protects the pump while available dry-break fittings minimize the risk of product spill during hose hook-up.